Very true and quite right too. This little Star Wars scribble is not intended to be a definitive critique or even a sensible opinion on the movie everyone has been talking about. It’s just my weekly word count on a subject where my mind has spent some time in the last week. Sam and I didn’t get to see the new ‘Star Wars’ until the day before Christmas Eve. We pretty much started off our holiday with it. I had used every filter I could think of to avoid any talk, spoilers, or opinionating about the film (and look at me now, prattling on about it myself, 'hypocritical git) but Sam had been ‘spoilered’ by some lads in his classroom picking over the more intimate revelations of the plot. That was a shame but he was still intent on enjoying the experience. Let me cut to the chase. I liked it a lot. We both did. But I had one or two reservations... niggles. First the ‘like’ part. It was like old times. It was gleaming and new in the places where it should have been and yet it remained retro and old in all the right places. There was emotional impact in the real world ageing of the returned central characters, something which helped me to almost believe that they really had been out there among the stars since the last time I saw them. There was spectacle and wit and humour and nostalgia. It was good, really good. We came out pleased and satisfied. 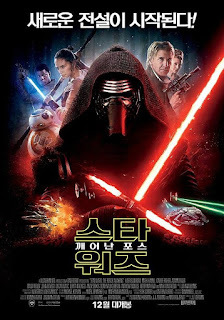 It seemed to me to be more of a Star Wars Tribute Film than a whole new adventure. It was how it might be if there was a pub act of Elvis Presley that was actually better than the real Elvis in every respect… except originality. Of course the new movie had to walk a line of giving the audience what they required, what they would demand. That was a given. But this film went so far with that… It was as if every scene from the original Episode 4 was jiggled ever so slightly and polished up. The threat looked and felt exactly the same, the set pieces were all unavoidably familiar. It was like Old Times. Very, very like Old Times. Perhaps this was the opening gambit of a new trilogy that will bring us onward to places and challenges we have never imagined. Perhaps this was just the opening act, introducing us to the players, reassuring us that we are in safe hands. On a lesser point, I spent the film fervently wishing I was watching it in 2D. Alas the 2D option in my town will put you in a boxy little room with no sense of audience or occasion. The 3D annoyed me though, as it almost always does. No matter how they try, it always ends up looking like those gimmick stereoscopic disk viewers we had when we were kids. A couple of layers of perceived depth, unconvincingly overlaid for effect. Changes in focus over-emphasised and nothing of import being brought to the deal. Come back to the big screens 2D, we need you. Finally, I thought the use of our Irish location, Skellig Michael, was astonishingly effective. I am aware of the issues with the protection of such a valuable place but, my golly, it looked good. I could see it becoming a movie visitors Mecca in the same way as those islands in Thailand which were used to such great effect in the Bond movie ‘The Man with the Golden Gun’ so many years ago. You can’t please everyone. If the new movie had not been as careful and reverential as it was, perhaps it would have failed and there would be no more. As it was, we were entertained and made to feel good and we paid out enough money to enable us to have another. In the end, that’s a win. I haven't been to see a movie in 3D since that Nightmare on Elm Street episode that you had to wear the stupid cardboard glasses for. I spent so long trying to get them to fir over my spectacles that I missed the whole damn flick (although I gather that may have been a bit of a win). If a film needs to rely on gimmicks then I figure that it can't be all that. Nonetheless, I fully intend to go and see the latest Star Wars offering, just so long as I can see it on a flat screen - though I have to say, I try to avoid the cinema since the advent of mobile telephones because I seldom find the story engaging enough to block out the constant annoyance of those around me - you've got all bloody day to eat and text your mates, just sit down, stay still and shut the hell up for ninety minutes. I thought no one cared what spirit animal I was. It will come as no great surprise to you to learn I have not seen The Force Awakens. I think I’ve seen the trailer. Or a bit of it. (I’ve also, for the record, not heard Adelle sing ‘Hello’. Not even a bit of it.) I did see the original trilogy. I’m not sure if I saw any of them in the pictures. If I did it’d be the first one before all the fuss started. But I don’t think I did. I, as you know, am a Trekkie—or Trekker as we (apparently) prefer to be called—and as such view all things Star Wars as science fiction from a lesser god. Actually I’m not that shallow but the truth is I really never have got into Star Wars and I love all things science-fictiony. Even a lot of the tripe. If there’s an alien of a spaceship in it then I’ll at least give it a go. Apart from Star Wars. I—eventually—watched Episode I. I caught maybe the last half hour of Episode II on TV once while I was waiting for something else. I’m pretty sure I’ve never seen Episode III. A bit like the Bond films I’ve not gone out of my way avoid them but I’ve also never made any real effort to see them. And I’m not sure why. I’ve read a lot about them, most of which I’ve forgotten, but nothing I’ve read has got me excited either. I dislike things that require hype. I knew about Tim Burton’s Batman YEARS before it came out and there was no way on earth it was ever going to live up to the hype and I was right. Don’t get me wrong it was a good film in so many ways but nothing—and I do mean NOTHING—could ever live up to the hype. That’s how I feel about all the films DC have lined up from Dawn of Justice on. It’ll be years before I get to see these films, before any of us will get to see these films, and yet every day it seems there’s another article discussing their pros and cons. There’s a school of thought that says if you have young children and fall pregnant again you shouldn’t tell them a new baby’s coming until a couple of weeks before your due date. Otherwise every day they’ll be asking you, “Is the baby here yet? Is the baby here yet?” And the same goes for sci fi fans and new films/TV shows. With regard to your comment about the new film being a bit too much of a tribute to earlier films, yes, I’ve read that and that’s only to be expected but it’s a fine line. I remember Alien 3 being heavily criticised at the time because it was different. And for a long time it was unappreciated but I think opinions are starting to change and people are starting to realise there was an awful lot good about it. If we’d never seen the first two we’d’ve been raving about it for years. And that is the problem with familiarity. It’s like the Borg. In Star Trek: The Next Generation they were a genuine menace. Not so in the Delta Quadrant where Voyager routinely shrugged them off. Or what about the Doctor Who episode ‘Dalek’. In that episode a single Dalek practically caused the Doctor to pee his pants. Jump forward a few dozen episodes and Matt Smith is prancing around in font of hundreds of them as if they’re nothing more frightening than tins of beans. Too many shows/films/books/comics/bands don’t know when to quit which is why we end up with twelve Friday the 13ths, eight Police Academies (plus a live action TV series and 65 animated episodes) and thirty-one Carry On films. Cleese was right to stop after two seasons of Fawlty Towers. I dozed off at the middle of the film. You're right, it's similar to A New Hope. But the brilliant ideas and images are still there, so at least I've watched the latest episode because I've always been a star wars fanatic.